Regardless of the size of a family, a kitchen is undoubtedly the most important space of the house. This is where food, drink, and spontaneous conversations happen. A kitchen needs to be compact and yet offer all the flexibility required to work in. For this, it needs to be functional space as well as look neat. There are several possibilities when it comes to kitchen remodeling options. You could work with the space you have and add more functionality to it, or it could be a change of looks. If you’re looking for ideas to spruce up your kitchen, then we’ve got quite a few of them for you! We’ve collected different kitchen renovation ideas, some big others small, which can help inspire you to better kitchen renovation ideas. These ideas help you get the most out of your culinary space and will definitely add to the oomph factor in your house. Dark is out, and light is in – contrary to earlier trends, kitchen spaces are a lot lighter themed these days. This helps maintain a feeling of airiness and space throughout. People suggest woody hues to go with muted or pastel shades which makes your kitchen feel a lot more warm and open. Cabinets and countertops ideally should be a different color compared to the walls to give your kitchen more variety. When it comes to adding style and an element of chicness, you really can’t go wrong with splurging on the backsplash. And it makes sense too because it’s a small area and you don’t really need to break the bank to break up the monotony of plain walls. There are several design elements that you can incorporate to elevate the style factor of your backsplash – upcycled bricks, patterned tiles or even a trendy, solid slab can make a huge difference. Changing the flooring is a fantastic way to get a whole new look for the kitchen. Choosing something that goes well with the rest of the house or using it as the basis for a new kitchen theme – both work wonders. When it comes to selecting kitchen flooring, you have to make sure that the material is both water and humidity resistant. Something that will always look trendy is hardwood flooring. You can choose any color and pattern you want. They are functional and look great with all sizes of kitchens and decors. Lighting is a critical part of every kitchen space. You need to make sure that you’re layering your lighting and not just put the same lights around and be done with it. Recessed lighting that is not too bright adds ambiance to your kitchen. 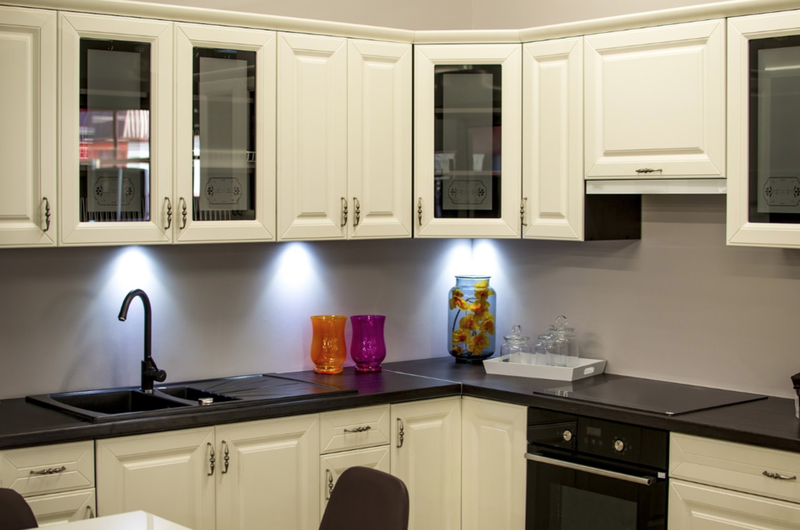 Couple them with spotlights in places where visibility is required like your kitchen island or under cabinets. If your kitchen is big enough, you could also add decorative lighting like pendant lights or even a chandelier. When it comes to upgrading the functionality of the kitchen, the sink and faucet are things that are central to everything in the space. There are several you can choose from but make sure that you get both of them at the same time so you can match the hole configuration. Your choices range from simple single-hole faucets to more functional wall-mounted faucets. Kitchen furniture is usually underplayed, but we think you can add personality to your kitchen when you opt for more stylish furniture. If you have space in your kitchen, you could opt for a kitchen cart where you can store your most used dishes, oil, or seasonings. Barstools on high kitchen islands add a bit of pizazz to the setup. Proper cabinet placement makes kitchens work. If you think your cabinets are too far high or deep to reach comfortably, you might want to look at a makeover. Incorporating Lazy Susans or pull-out organizers (if you don’t have them already) can increase your kitchen’s ability to be functional. Kitchen specialists can help sort out more options for you to consider. As you can see, there are a lot of options when you need to increase the style and functionality of your kitchen. People use different materials to furnish their kitchen or even totally renovate it. Hardwood is a great alternative which is durable, wallet-friendly and free from maintenance. If you’re thinking of getting the entire kitchen done up with wood, you could take a look at Hamill Creek's selection of timber floor plans to get an idea of how you could add a modern yet warm touch to your space. Not all kitchen renovations are expensive, a lot of them are effective but can work for frugal budgets as well. Considering the fact that kitchen renovations add so much more to the home, it’s quite alright to spend a bit once a while!